Currently in Clinical Trials in Kabwohe Clinical Research Center (KCRC), Kabwohe, Uganda. Study design: This is a diagnostic validation study, comparing a new diagnostic device to a reference standard. 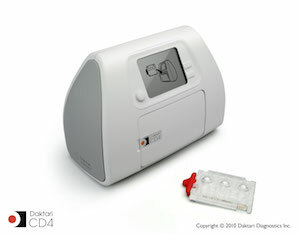 In this case, a novel, portable, battery-operated point-of-care CD4 counting system developed by Daktari Diagnostics will be compared to flow cytometry for accuracy and performance under typical operating conditions in research facilities in Kabwohe and Jinja, Uganda. The study will evaluate fingerstick CD4 counts on the portable system collected and run at local HIV facilities, and compare them to CD4 counts from venipuncture blood collected simultaneously and run on flow cytometers at local or remote laboratories. Device cartridges are currently slated to be manufactured in Scotland.